The industrial metal working and electrical occupations form a group which occupies a virtually unique status in terms of being a focal point for the ongoing digitalisation of the world of work. Acting on behalf of the Federal Government and working in conjunction with the social partners and experts from company practice, the Federal Institute for Vocational Education and Training (BIBB) has now adapted the training regulations for eleven metal working and electrical occupations in order to meet the new challenges. Digitalisation of work, data protection and information security have all now become integral components of training. Various optional additional qualifications will also enable companies occupying different positions within the digitalisation process to take a targeted approach to establishing competencies in order to embrace the digital shift. The amendments enter into force on 1 August 2018. The pace of digital changes dictates just how drastic the shift at companies providing training will be. Differences are exhibited by factors such as product cycles and investment and innovation behaviour. This means that pressure to take action to modernise training programmes also varies. On the other hand, amended training regulations can create even more leeway by introducing possible additional qualifications. The occupational profile item of “Digitalisation of work, data protection and information security”, which is to be imparted in an integrative way over the whole course of the training period, is new for all occupations. Changes to the training regulations have also been included in the occupational profile items of “Company and technical communication” and “Business processes and quality assurance systems within the area of deployment”. The skills which need to be demonstrated will be covered in Part 2 of the extended final examination. The skeleton curricula for the vocational schools have also been revised at the same time and on the same basis. New additional qualifications have also been developed. 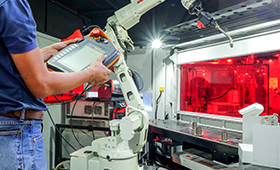 For the metal working occupations, these are process integration, system integration, IT-based plant modifications and additive manufacturing procedures. Additional qualifications introduced for the occupation of mechatronics fitter are programming, IT security, digital networking and additive manufacturing procedures. The electrical occupations will include programming, IT security and digital networking in future. The recommended time for the imparting of all additional qualifications is eight weeks. Testing takes place in the form of a task-based oral examination included in the final examination. These optional training contents are separately certified and also constitute provide trainees with an attractive way of expanding their skills sets to include new competences which are in particular demand. The additional qualifications also improve initial opportunities for skilled workers to pursue continuing training. Preparation of implementation guides for training managers is currently ongoing. This work is being conducted in conjunction with experts under the lead management of BIBB, and the guides will appear in the BIBB “Structuring Training” series of publications. The Association of German Chambers of Commerce and Industry (DIHK) is drawing up a relevant guide for examination board members.